Going to a magic show is always fun...wait, actually that's supposed to read "never". For a magic show that doesn't need sleight of hand to trick you and several other seven-year-olds into enjoying it, check out Hollywood Magic Bar, starting this Sunday. Probably the weirdest thing you'll do this weekend, assuming you're not accidentally kidnapping Jeremy London and forcing him to smoke drugs, TMB's a weekly night at Level 3 in Hollywood and Highland, with awesome kitsch (wispy smoke everywhere! ), and bartenders who, no joke, also happen to be professional magicians, making "magical" drinks...so enjoy drinking that hat filled with rabbits & Criss Angel! They'll give you as much magic as anyone not holding a stack of those cards can handle, including trickery from a dude who has a bachelor's degree in magic (seriously), close-up magic table-side available by lighting up a crystal ball (also for seriously), two performances a night from legit dudes who aren't Criss Angel, and actual at-the bar tricks like cocktails that levitate. And that's not all: drinks're constructed by a hireable company called Magixology to melt your face with rotating craziness that could include face melting! 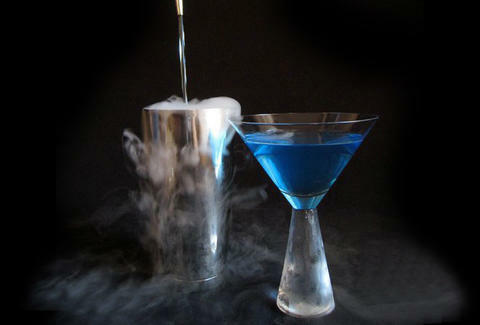 cocktails that change colors, some that include oils so that the smell is much different than the taste, and, along those lines, edible garnishes like cucumbers that actually taste like strawberries, and strawberries that actually taste like, yep, Criss Angel! (NOTE: Thankfully not actually true). They've also got fortune tellers, go-go dancers, and DJs, and to get in, you gotta pay for a reservation, which's $15 in advance or $20 at the door, but with a flick of this magic wand, they're actually...nope, still $20 at the door.